I am currently reading Neva Hassanein’s 1999 book entitled Changing the Way America Farms: Knowledge and Community in the Sustainable Agriculture Movement. In the book, she begins by looking at the history of agricultural science in the US and the worldview assumptions behind the way science has developed. Both the public research done at land-grant universities and by private companies assumes that agricultural progress is intrinsically good and that the associated increases in production are good for economy. This presupposes that the natural world is knowable and that increasing our knowledge of nature through objective observation is possible. But the world doesn’t necessarily like to be generalized, instead it’s messy and inconsistent (as I’m sure many of us have observed in our own lives). Weather, climate, soil, farm practices, inputs, and even economic pressures affect what happens on the ground and this can vary dramatically from one farm to the next, even when farmers are neighbours. This doesn’t mean that agricultural science cannot contribute to better farms, but it does mean that the way we design these systems needs to change. We can’t assume that a one or two varieties of a crop like corn are enough to have a resilient food system. Just because those corn varieties have Bt resistance (a toxin that repels some insects) doesn’t mean that they are also drought resistant. Most varieties of a plant are bred for only one or two traits, but with climate change making weather patterns less predictable, it’s becoming increasingly difficult to predict which traits will be necessary in the future. Encouraging a wider range of varieties that are locally adapted (meaning that they are grown and harvested by farmers in the same place, year after year), is just one way to change the way agricultural science is designed. Minimizing the importance of locally adapted varieties that farmers can save themselves for generations could lead to decreased food security for everyone. Seeds are just one part of the picture though and if we think about the strength present in a diversity of plant varieties, then maybe it’s possible that there’s also strength in a variety of farm practices and techniques. Diversity in agricultural science is just as important and maybe more important in agricultural science as it is in maintaining a healthy and biodiverse agricultural ecosystem. Maybe we need farmers who know how to raise pastured chickens as much as we need farmers who know how to grow fruit trees and farmers who know how to make cheese as much as we need farmers who grow oats and wheat. And maybe we need to make sure that knowledge isn’t privileged; that universities aren’t only teaching agricultural science students how much chemical fertilizers to apply and how to understand commodity markets, but also teaching them to think critically, ask questions, make observations, and understand whole systems not just a reductionist version of it. 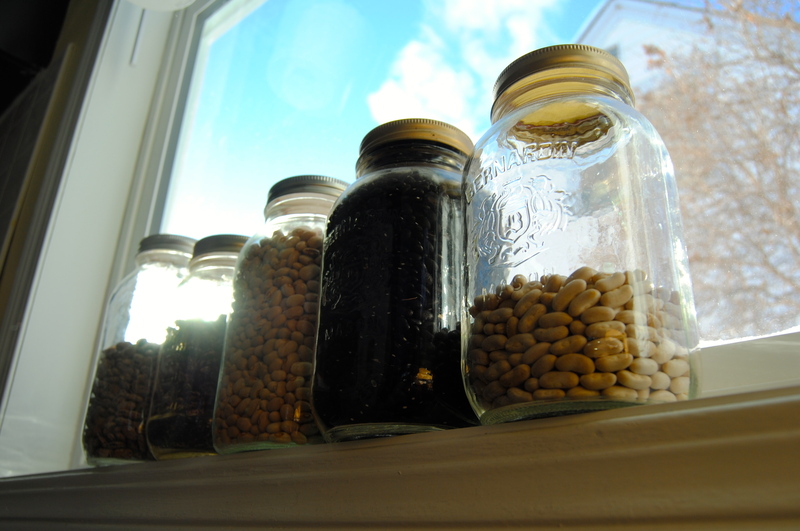 These bean seeds can be seen as five kinds of knowledge each in their own container. Or each bean seed can represent an individual farmer using different kinds of knowledge and therefor hundreds of slightly different beans with slightly different genetic information which will create different farm systems when they go out into the garden of the real world.